TUNIS, Tunisia (AP) — Tunisia's president promised Monday to submit a bill to parliament soon that aims to give women equal inheritance rights with men, as debate over the topic of inheritance reverberated around the Muslim world. In a speech marking Women's Day in Tunisia, President Beji Caid Essebsi said he wants to submit the proposal "as soon as possible," probably when parliament resumes in October. The current system, which is based on Islamic Shariah law, generally grants daughters only half the inheritance given to sons, and is standard practice in most Muslim countries. Many Muslim clerics see the inheritance rules as enshrined in the Quran, Islam's holy book. Since independence from France in 1956, Tunisia has been a standard-bearer in the Muslim world for women's rights. Last month, a woman from Tunisia's moderate Islamic party was elected mayor of Tunis, the capital, the first time a woman has held the post. The president's decision is based on the recommendations of a 300-page government report known as the Colibe report. It recommended the change in inheritance rights as well as proposals to end the death penalty and legalize homosexuality, which now in Tunisia is outlawed and punished with three years in prison. Essebsi said Monday his decision is based on Article 2 of the country's Constitution, which he said "stipulates that Tunisia is a state based on citizenship, the will of the people and the supremacy of law" rather than religion. 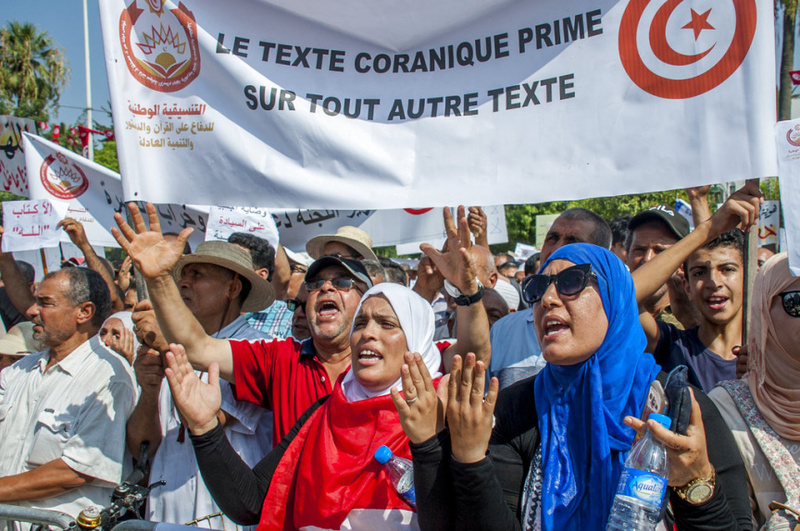 On Saturday, thousands of fundamentalist men and veiled women marched under a blazing sun from Tunis to Bardo, outside the capital where Tunisia's parliament is located, to protest the Colibe report.